We celebrated our princess birthday party with great fun, she enjoyed thoroughly, thanks to everyone who wished and blessed her. 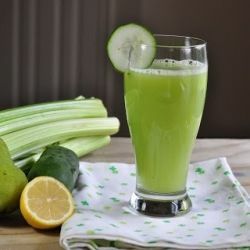 Since birthday party has heavy with pizza, cake and gulab jamun, I thought I will start this week with a healthy juice. I have seen on Dr OZ show that there is even a 3 day weekend detox diet, for which you have to drink 5 juices a day and eat one meal that has only fruit and vegetables.